GOLDEN EYE is very unique in many ways. He is Delight's only Goldwyn offspring, her natural calf. He is a high...progeny proven bull with no Shottle, O Man , BW Marshall or Prelude in his pedigree. He follows our criteria of offering the breeds very best cow families, for ACTUAL production both high lactation and lifetime, Excellent type for generations, extremely high components, depth of pedigree and the ability to produce top proven sons. He is a BIG. TALL, LONG... fancy bull, much better than his photo. 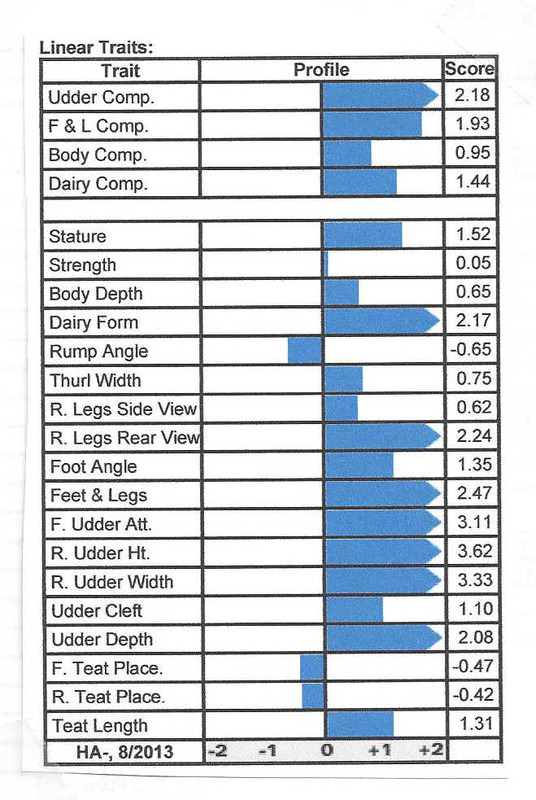 His aAa code is 4(strong) 3(clean bone) 2(tall) 1(dairy) ,56...which confirms that he will sire Dairy Strength.. His dam is scored EX(94) and his gr dam is EX(100) for Dairy Strength! He is siring clean flat boned, tall dtrs. with outstanding production and type .Many offspring are now milking....long black and FANCY! He has been tested negative for all known genetic recessives. He is an outstanding overall type improver, a breed leader in Dairy Form and Rear Udder Hgt & Width. Fore Udder, Rear Legs, rear view. A great cross on most cows including DELLSTAR, CARL , ZADE , DORON , Morty, Braxton, Blitz and Shottle dtrs. He is siring TALL, FANCY cows now milking as 2, 3& 4 yr. olds when the really blossom, the best cows in their herds! GOLDEN EYE Dtr.Flatness-Intl GE Lucky VG(85)VG(88)Mam,@3-05,2nd lact.103 lbs milk 3.8%F 3.6%P daily. 2nd lactation photo Now fresh 3rd time, may go EX with EX Mam... but now VG(86)..maybe next time! Now milking 120 lbs M 4.9% F,3.6% P...many GOLDEN EYE dtrs. with 5% Fat! Windsor-Manor Z-Delight-ET TV 2E,EX(93),EX(92) Mam.GMD, Zip's best dtr. Gold Medal Dam, Dam of Merit, 3 sons on (4/10) top 100 TPI list ! Former No.1 Prod. Life Cow of the breed! 4-07 2x 365d 39,230m 3.8% 1490f 3.3% 1298p, .over 200,000m Lifetime! THIRTEEN Excellent offspring. GOLDEN EYE's 3rd Dam, a Jolt dtr ,EX(90)3E DOM, also 200,000 lbs m.